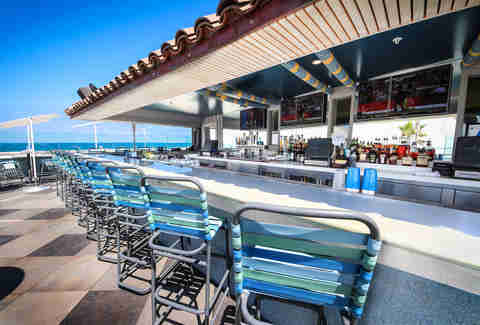 While it may LOOK like a pool with its aqua-tiled walls and lane dividers hanging above the bar, please don't actually do a cannonball into Cannonball, because you'll likely injure someone just trying to enjoy the newest addition to Belmont Park in Mission Beach, representing San Diego's largest (and arguably most picturesque) oceanfront rooftop bar. 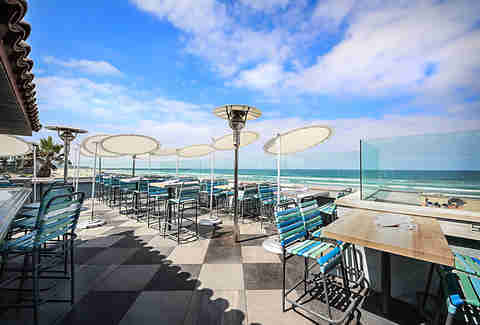 Every community pool-looking chair has a stellar ocean view overlooking Mission Beach, so there's not a bad seat in the house -- and soon there will be even more. 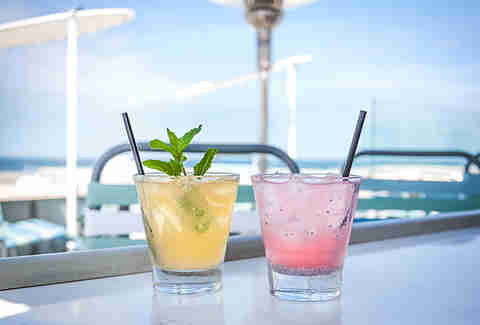 They plan to open a lounge area and an additional section of the rooftop in the next few months, further solidifying that biggest oceanfront rooftop status. 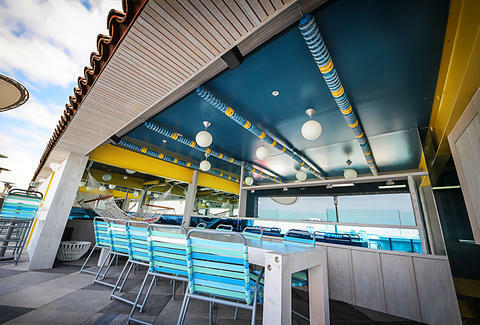 Those lane lines decking out the bar were snagged from Plunge in Belmont Park; after all, it's only fitting that the decor would come from SoCal's largest and most historic indoor pool. 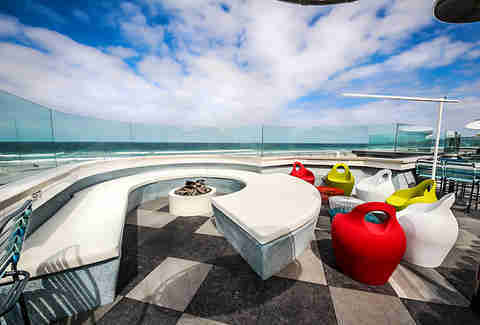 Circle around the fire pit to take in the sunset and warm yourself during those notoriously frigid San Diego evenings. 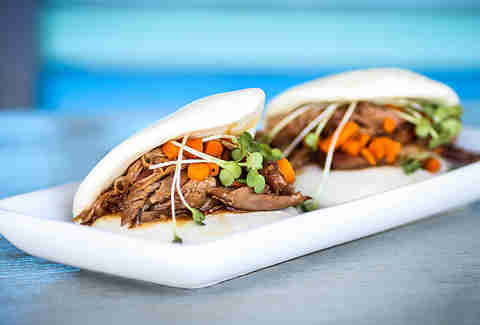 Not just a magazine Donald hides from Daisy, these duck buns are stuffed with confit waterfowl, hoisin daikon, and pickled carrots. Fire isn't just used decoratively. 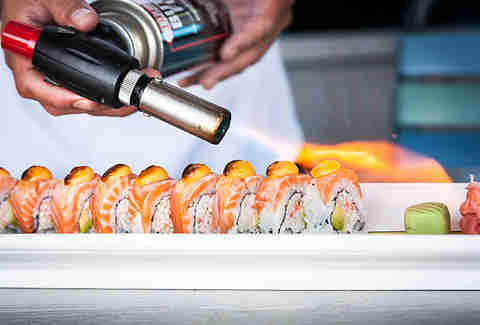 Salmon gets torch-seared atop this Enfuego roll filled with crab, avocado, and roasted garlic aioli. 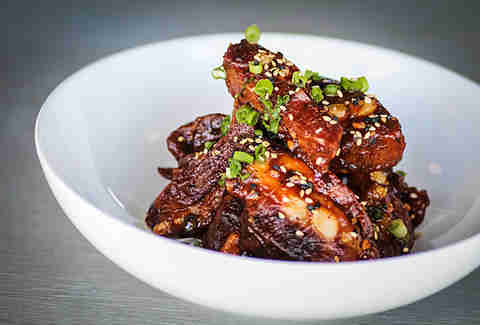 Plum-glazed and sprinkled with sesame seeds and green onions, the pork rib tips are meant to be shared... and destined to be devoured solely by you as you menacingly stare down everyone else. 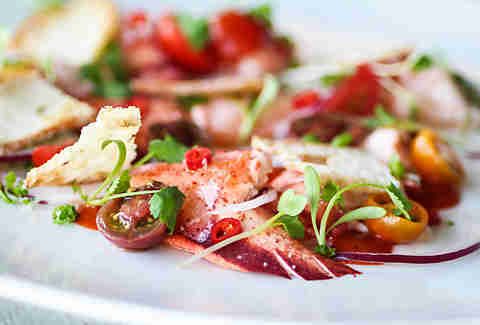 East Coast meets West (thanks, Ming Tsai) in the Maine lobster salad with spicy yuzu dressing, baby heirloom tomatoes, and pepper puree. Along with an Asian-leaning lineup of beers on draft and several sakes for bombing, there's also a cocktail menu featuring the Ginger Ta-tonka (Buffalo Trace bourbon, lemon juice, ginger beer, peach bitters, mint) and the Drunken Botanist (vodka, lemon juice, raspberry, simple syrup, soda, and basil seed) -- just don't have so many that a literal cannonball starts to seem like a viable option.